Out of all of the mysteries of ancient history, the lost City of Atlantis is considered to be the most intriguing, the most puzzling, and the most profound. The legend of Atlantis is – most likely – mythical in nature. This amazing island-based nation was originally mentioned in the dialogues of Plato. These refer to the conversations that occurred between Hermocrates, Critias, Socrates, and Timeaus. 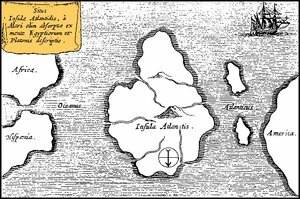 In responding about ideal societies to Socrates, Critias discusses Atlantis, the lost city. In speaking of the Atlantis event, Critias states: “Then listen, Socrates, to a tale which, though strange, is certainly true….” This very quote has intrigued individuals throughout history. Is the Atlantis lost empire story true? Did the unfortunate Atlantis event really happen? Is the legend of Atlantis historically factual? The lost City of Atlantis has been, is, and continues to be one of the most questioned greatest unsolved mysteries of all time. What Did Plato Write about The Characteristics of The Lost City of Atlantis? Plato described the lost City of Atlantis as a highly advanced and immensely powerful empire that sank within the ocean in just one night and one day around the year of 9,600 B.C. The ancient people of Greece were heavily divided on whether the story held historical significance or if it was merely a literature-based metaphor. The island that held the Atlantis lost empire was described as being exceptionally large. In fact, it was stated that it was larger than the area of Asia Minor and the region of Libya, combined. The region it was said to have stood was the Pillars of Hercules. Many have interpreted this to mean the area of the Strait of Gibraltar. What was The Lost City of Atlantis Like? According to Plato, the Atlantis empire consisted of a culture that was highly advanced. The overall constitution had a lot of similarities of the one that was precisely outlined in Plato’s work called Republic. The god named Poseidon was said to protect the island where Atlantis was located. It is said that he named his son, Atlas, the king of the Atlantis empire, as well as the surrounding sea. As time progressed, the people of the area – identified as “Atlanteans” – grew immensely powerful; however, the ethics that they once possessed declined. The Atlantean army started conquering areas, such as areas in Africa and Europe. Then, an Athenian army forced them back to their island. It is said that the Atlantis empire suffered a divine-based punishment. This included extreme earthquakes and dangerous flooding. This punishment was the Atlantis event that led to their demise, resulting in the island to sink into the depths of the ocean. The validity of this Atlantis event has been speculated throughout history and has resulted in Atlantis being considered to be one of the greatest mysteries of ancient history. Where Did the Story of the Atlantis Empire Originate? According to the Critias dialogue written by Plato, the story of the Lost City of Atlantis was passed down from his grandfather. He stated that his grandfather obtained the story from Solon, an Athenian-based statesman who lived approximately 300 years prior to the birth of Plato. Solon was given the information from an Egyptian-based priest who explained that the fall of Atlantis had occurred 9,000 years prior. It is interesting to note, that while many claim that they do not believe the lost City of Atlantis story, that Plato’s follower, named Crantor, did believe the story. What Do Scientists Say about the Existence of the Atlantis Empire? In all actuality, very few science professionals believe in the story of the Atlantis empire. Robert Ballard, who is an ocean explorer and known for his discovery of the Titanic wreckage in the year of 1985, has been known to have said that no one classified as one of the many “Nobel laureates” has actually stated that the story holds any truth. He went on to say, though, that the Legend of Atlantis is considered to be “logical” due to the natural cataclysmic events that have happened throughout the course of history, such as the eruptions of volcanoes and immense floods. For example, approximately 3,600 years past, a massive eruption of a volcano resulted in immense devastation to the Santorini Island, located near Greece. The people that lived there were highly advanced; however, they suddenly disappeared after the eruption. Therefore, the possibility exists, but no solid evidence has established that the lost City of Atlantis existed. What Makes the Legend of Atlantis so Popular? It is believed that the legend of Atlantis is popular – even today – because it was rumored to be a utopian-based civilization. All throughout history, people have strived to create utopias, but, with little to absolutely no success. It is said that the people that lived in the Atlantis empire were spiritual and moral. Unfortunately, as time progressed and their technologies advanced, they became consumed with greed and selfishness. It was then that the gods – who had blessed the island – became very angry. Due to their pursuits of the immoral, they were punished. As a result, their great empire sank into the sea. Though considered to be one of the most intriguing mysteries of ancient history, could this be our fate today? Both the lost City of Atlantis and the answer to this question will live one as two of the greatest unsolved mysteries of the world.